American DJ Inno Spot Elite DJParts - All Variety of Parts that DJ Needs. ADJ’s Inno Series of Intelligent lighting fixtures continues to push the boundaries of LED technology with a reputation of professional features and reliable performance. 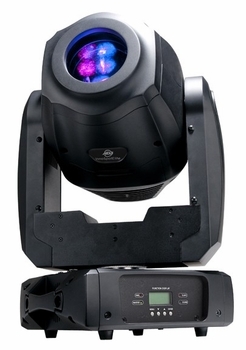 The Inno Spot Elite Intelligent Moving Head boasts an extremely bright 180-Watt LED source. Its professional features include: 7 rotating, replaceable gobos plus spot (6 are glass gobos and 1 is metal), 7 colors plus white, and separate gobo/color wheels. Its hard edge beam is similar to a traditional halogen or discharge lighting effect with a fraction of the power draw (197W) or the hassle of changing out light bulbs (LED source rated at approximately 50,000 hours). The Inno Spot Elite is packed with exciting built-in light shows when used in Sound Active or linked in Master/Slave mode, offers 15 DMX channels, a motorized focus and Iris, 4-Button LCD DMX menu, Dimming, Shutter and Gobo Shake effect. The Inno Spot Elite may be controlled via Sound Activation with its own built-in programs, a DMX Controller, or the ADJ UC3 easy-to-use controller. Specifications: • High output Intelligent Moving Head with a bright white LED source • 8 Colors + Spot • 7 rotating, replaceable gobos + spot • 6 Glass and 1 Metal Gobo • 3 Operational modes: DMX-512, Sound Active or Show Mode • Separate color & gobo wheels • Gobo scroll mode • Motorized focus & Iris • 19-degree beam angle • 15 DMX channels • 4-button DMX LCD display • 4 Built-In show modes • Gobo Shake effect • 6-facet rotating prism effect • Gobo size: 27mm (22mm viewable / 0.2mm thickness for metal gobo, 1.1mm thickness for glass gobo) • 540° pan / 270° tilt (16-bit) • Fine Pan /Tilt • Shutter: Pulse effect; random strobe slow to fast • Dimming: 0% - 100% • Fan Cooled • Stepper motors with micro stepping • Omega Clamp Included • Linkable: DMX via 3-pin XLR cable; Power via IEC daisy-chain power link (Up to 2 Inno Spot Elite’s @ 120V, 4 Inno Spot Elite’s @ 220V fixtures) • Compatible with the ADJ UC3 Series easy-to-use controllers (sold Separately) • Power consumption: 197W (Full on) • Multi-voltage Operation: AC 100 - 240V, 50/60Hz • LED Source: 180W White LED source, 8000K (Rated at approximately 50,000 hrs) • Lux @ 3M: 4840 Lux • Dimensions (LxWxH): 13.25” x 13” x 20.75” / 333 x 328 x 526mm • Weight: 29 lbs. / 13 kgs.